When the weather outside is frightful, why not learn about some wildlife? 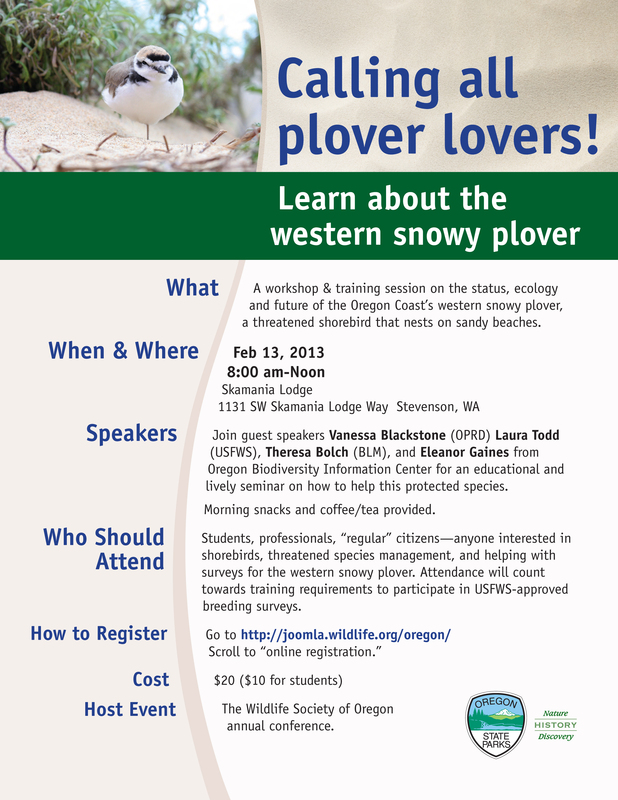 OPRD is hosting a Western Snowy Plover Workshop on February 13, 2013. The workshop is from 8 am until noon at the Skamania Lodge (1113 SW Skamania Lodge Way, Stevenson, WA) in conjunction with annual meeting for the Oregon and Washington chapters of the Wildlife Society. Anyone can attend! The goal of the workshop is to provide all the current information on the plover’s population, recovery and management goals, changing recreation on Oregon beaches to aid the plover, and survey methodology. Attending this workshop will count as the needed “classroom” style information required to survey for the birds during the breeding season (Note: You need a USFWS recovery permit, or to be listed under a permitted biologist’s permit, to survey for plovers during breeding season). Guest speakers include Laura Todd (USFWS), Theresa Bolch (BLM), Eleanor Gaines with the Oregon Biodiversity Information Center (ORBIC), and me! Registration is $20 for adults and $10 for students. Morning snacks and coffee/tea are provided. I hope you’ll join me there!